Manage one (or more) remote with IR reception on COM port. 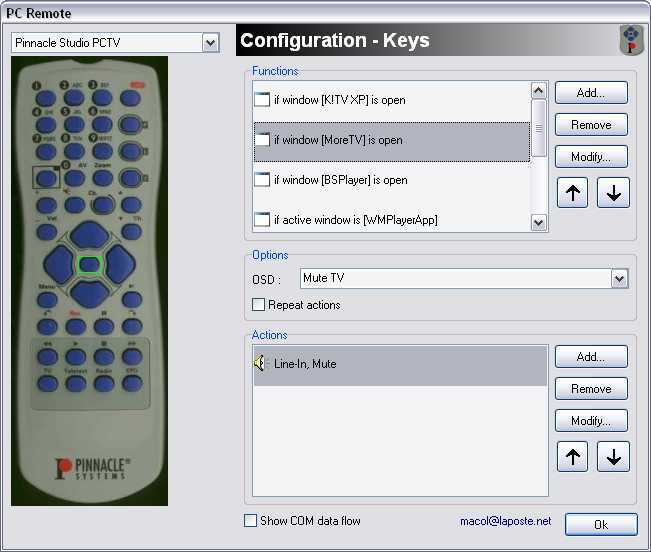 This program is initially designed for the PCTV remote from Pinnacle, it can also be used with the remote of the Guillemot MaxiTV 3 card TV and the Real-magic remote and it should work with any remote with a COM port IR reception. A wizard helps you to configure your remote during the installation. Now support both french and english languages. You can choose the key to configure by clicking on it in the picture or by pressing the key on the remote. There are several functions for each key depending on the active window, existing windows or on values of internal variables. There are several actions for each function (if necessary). any remote by defining custom keys.